As mentioned in the last update, Jim Clanin felt the competency of the rock in the ceiling of our drif t would allow us to widen the drift substantially. The first 10m or so was only cut 4m wide. Now we decided to go back nearly to the beginning of the drift and take a cut angled into the down dip wall. This would make the drift wider the farther in it went. We started the process by drilling three 8' long holes with our drifter but taking care to assure that the lower hole was well above the mineralized zone. If the shot went well our drift would be more than a meter wider at the end of the holes. After the shot we were pleasantly surprised to see that we had just peeled off the roof of a pocket. Reaching in we could feel large amounts of golden cookeite sand. Mary started to work the pocket and soon she was finding nice smoky quartz crystals and gemmy elbaites. We continued this widening process until we had reached the end of our drift. By that time we had widened the drift by several meters. As we did so, we found a number of small pockets in the down dip ( southern wall of our drift). Each of these carried a little elbaite, some smoky quartz crystals and cookeite. In fact there was a continuous seam of cookeite with minor lepidolite now showing in the down dip face just above the garnet line . This was something new. Heretofore, the cookeite was isolated to the cavities themselves. In pocket number 7, opened May 17 during this widening process, we were surprised to find two small clusters of rose quartz crystals. These were embedded in a mass of clays that appeared to be an alteration of some phosphate minerals... perhaps lithiophilite/triphylite. These clays were in the apex of the pocket instead of the bottom. 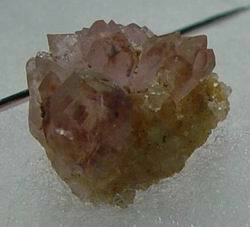 Although Newry is credited as the type locality for rose quartz crystals they may have been first reported from Mt. Mica by Nevel ( Minerology of Maine Vol I). 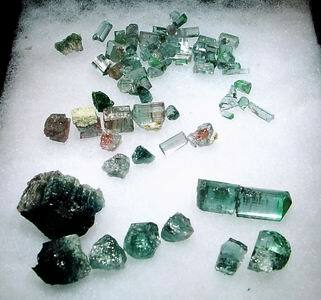 Frank Perham also found some of these crystals when he mined at Mt. Mica during the 1960s'. Perhaps the most notable feature as we continued to advance our drift was the expansion of the Li bearing zone. 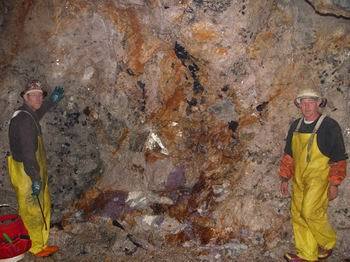 Besides the lepidolite, spodumene and montebrasite we becoming abundant and increasing in size. Although our plan was to continue to turn our drift to the south (down dip) we kept it wide enough to maintain this Li zone exposed. We were now kept busy collecting this material as much of the lepidolite was of carving grade. Additionally our practice had been to remove the pegmatite right to the hanging wall as this provided the most stable roof. The trick was to not blast and fracture the schist that formed the roof. Drilling horizontal holes to within .3m of the roof seem to provide breakage right to the schist. 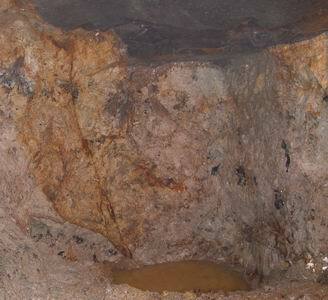 Of course this required us to probe and locate the schist so as to correctly locate the holes to be loaded. We were surprised therefore when suddenly the schist rose by several meters. 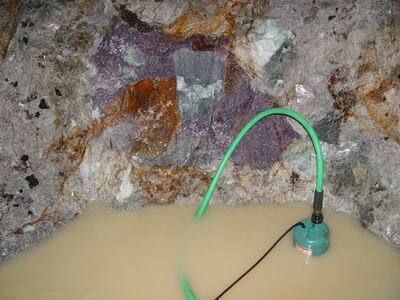 It appears we had mined into another offset or thickening in the pegmatite very much like we had encountered outside in the main pit. ( See http://coromotominerals.com/MM04October.html ). Perhaps the expansion of the Li zone was following similar pattern to what we had observed taking place in the main pit. As discussed in these pages the garnet line is the pocket zone signpost at Mt. Mica. 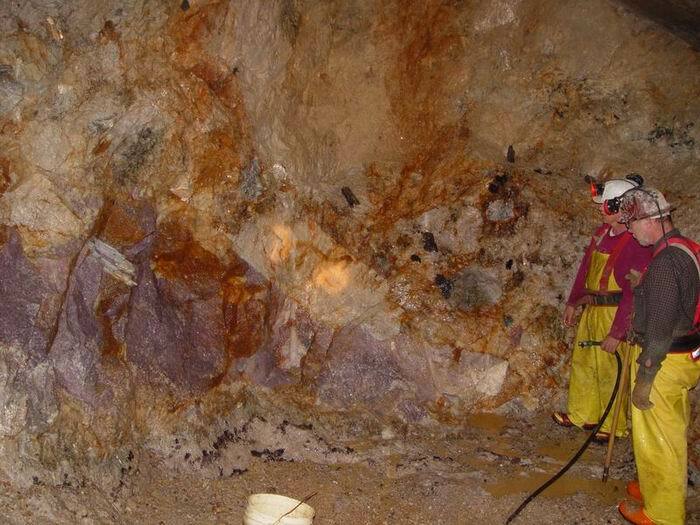 As the pegmatite thickened there was still a clear lower garnet line, the one we were following, but now there was a confusing array of garnets both in clusters and 'lines' ascending into the left hand or up dip side of the drift. As we advanced our drift the pegmatite had been plunging to the east and dipping to the south. This dip and plunge had required us to repeatedly drop the floor of our adit so we could successfully muck as we mined along. Before we knew it, the roof on the left side of the drift was more than 5m above our heads. Although the mineralization looked enticing and in fact there was watering seeping from a rusty area, always a reliable pocket sign, we had to temporarily abandon working the drift on the far left side and now take a narrower cut as we advanced. In the diagram at the top of the page the narrow cut is the start of another advance. We next widen the cut down to the down dip face. Besides the encouragement provided by the mineralization, the appearance of a large rusty crack on the left side of our drift portended a pocket ahead. Our group was somewhat divided on this issue. Richard and I and seen this pattern a number of times so there was little doubt on our part. During June we continued advancing our drift and turning it down dip. 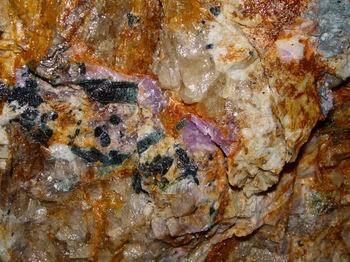 I was scheduled to give a presentation on Mt Mica at the Maine Pegmatite Workshop. I planned to present my views on pocket signs that work at Mt. Mica. So in order to validate my 'signs' I decided to scan our drift looking for pockets using these 'signs'. After washing the entire drift down we probed any promising looking spots. In fact we found two small pockets. One was near the beginning of our drift and one was in the floor of a burn just completed by Richard and Jim. 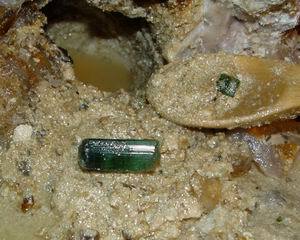 The pocket in the burn cut, which Jim opened with his scaling bar, produced some fine blue gem elbaite. We were becoming amazed at the quantity of lithium minerals that were now showing up in our drift. Our next advance produced both a widening and thickening of this zone. In Maine, Black Mountain is noted for its huge mass of lepidolite with locked in rubellite crystals. Though I have not been to Black Mountain I am told by others that the pod we were now exposing was even bigger. Everything associated with this mineralization was on a scale larger than we had seen at Mt. Mica. For example there were several exposed microclines more than a meter in length. The mica books, many of which were rimmed in lepidolite, were up to .5m in length, We were not expecting to find pockets with such lepidolite but we knew from experience that what once we reached the margins of the mass we could expect to start finding pockets again. Would these be on the scale of the mineralization too?